In this depiction of the regatta, Lane has provided a view of the start of the three second class yachts, which are grouped together at far left (See New York Yacht Club Regatta (2), 1856 (inv. 270)). The yachts of the first class are the last to start, and most are still hoisting sail or weighing anchor in preparation for their 11.00 a.m. starting gun. The large sloop under mainsail and jib (left foreground) may be the “Julia” which was first across both starting and finish lines. Her most noteworthy guest was Robert Bennet Forbes, whose account of this race is included in this entry’s Historical Materials supplement. This painting shows the starting line scene from the Fairhaven side of the harbor channel, looking west. 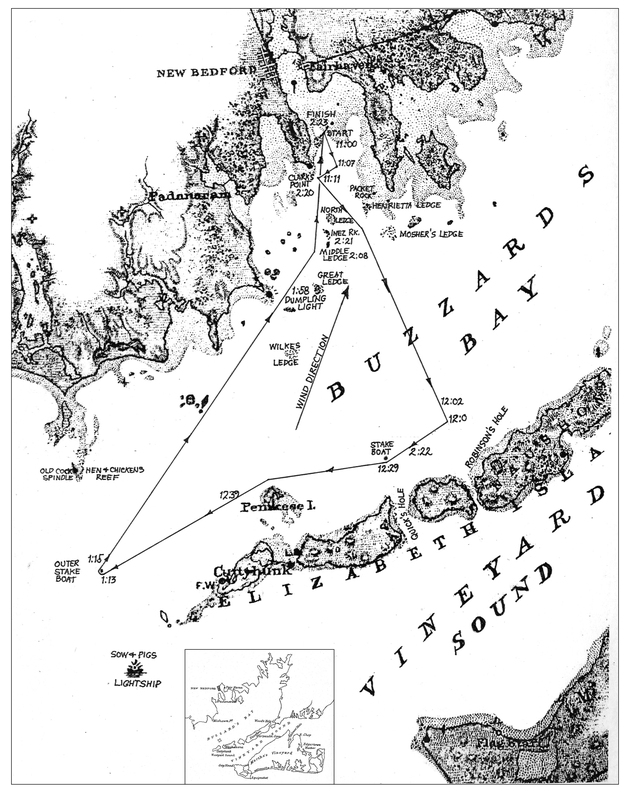 The starting line itself ran south-west to north-east (when facing north), from Butler’s Flats (just north of Clark’s Point) to a beacon marking the east side of the harbor channel (not visible in the painting). Leaving the harbor put the yachts on a starboard tack, close-hauled, headed south-east by south until they were due east of Clark’s Point. They then came about, headed south-west briefly, tacking again to resume their original heading toward the Elizabeth Islands and the stake boat off Quick’s Hole. In the foreground are two small boats with spectators who are finding the wind and waves about all they can manage. For good reason, Buzzard’s Bay small craft were noted for their weatherly designs and substantial construction, seen here in two sturdy examples. 1988 National Gallery of Art: National Gallery of Art, Washington, District of Columbia, Paintings by Fitz Hugh Lane, no. 33, ill. in color, 78, as New York Yacht Club Regatta (3). Wilmerding 1988a: Paintings by Fitz Hugh Lane, ill. in color p.78, cat. 33, as New York Yacht Club Regatta (3). Citation: "New York Yacht Club Regatta (3), After 1856 (inv. 396)." Fitz Henry Lane Online. Cape Ann Museum. http://fitzhenrylaneonline.org/catalog/entry.php?id=396 (accessed April 22, 2019).